We drove to San Antonio on Friday afternoon for the weekend. It’s one of the oldest cities in Texas and also one that gets the most visitors every year. It is very easy to see why. We drove into the hotel and the city looks just like most of the Texan cities we’ve visited – lots of modern, tall buildings, with some older historic buildings in the mix. 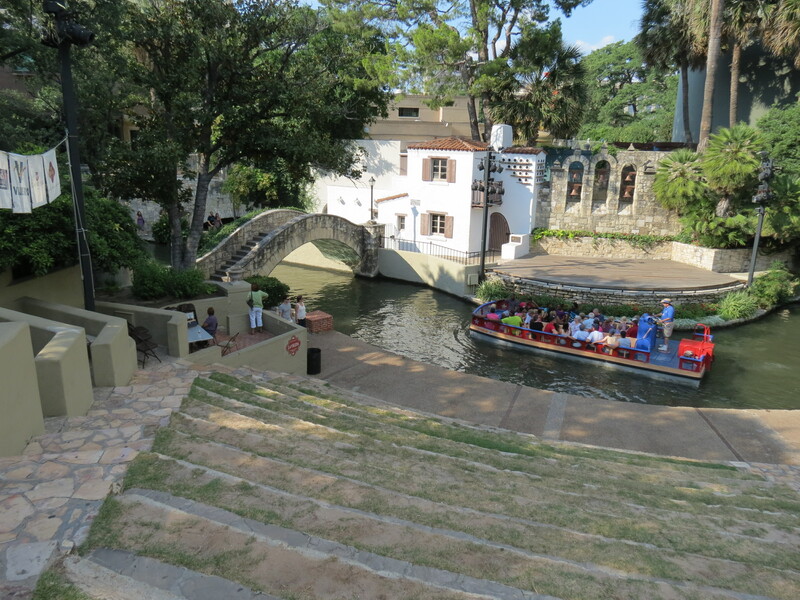 But San Antonio has a secret: below street level is a river and a canal which you can wander along and it is beautiful: pretty lights, boat trips, outdoor theatre, Mariachi bands, restaurants and ice cream shops. 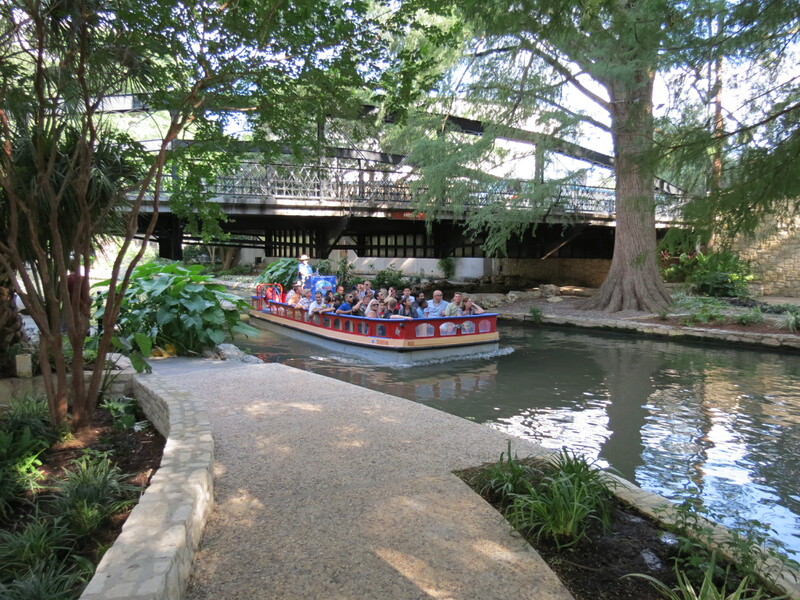 This is one of the reasons that people visit – to walk up and down the Riverwalk, eating ice cream and people watching. It has a very European feel to it, with little stone pedestrian bridges over the river and trees growing from either side to meet in the middle (all beautifully lit at night). It could almost be Venice. The Riverwalk came about through a disaster in 1921 that saw much of downtown San Antonio flooded 10ft deep from the overflowing San Antonio river. Countless homes and business were destroyed and about 50 people died. To prevent this from happening again a dam was built with a canal to take flood water safely through the city. The original idea was to bury the canal, turning it into an underground storm drain but locals decided it would be better to develop it as a business district and so they did. We have dinner in a great fish restaurant (Ostra) and eat one of the best meals we’ve had since being in America. Even the girls eat, despite being so hot and it being after 8pm. My Mum buys us all huge ice creams to eat before heading back to the hotel (the Westin Riverwalk – it’s very nice, although I think the girls are going to be disappointed as they expect every hotel to give them a huge teddy bear like Hotel Drisco in San Francisco!) We ask for 1 scoop of ice cream each but it seems that 1 scoop doesn’t mean the same thing here as it does at home – we get a whole cupful each. Must watch that tomorrow as none of us managed to finish our ice cream. Maybe we can share one between 5 next time! The walk home is busier and hotter – mainly because my Lovely Husband and I are carrying a heavy child each! But the loveliness of the surroundings helps and we can’t wait to explore more tomorrow. It was really beautiful and we’ll be heading back as soon as we get the chance.